You can not find the Watch you are looking for? Maybe it is a rare Special Edition or a very unique configuration? Just fill out our "Special Order Request Form" and we will find the Watch you are looking for. Once we found it, we will contact you and you can decide if you want to buy it. What is a Special Watch Order? A special order is when we don't have the watch in our available inventory and we order you the configuration of the watch you want, exactly the way you want it. In general we can get you a special order watch in just 2-4 days. However, if the dial color is hard to find or bracelet configuration is difficult to come by it may take up to 3 weeks. How do I order a Special Watch? Step 4: Pick up or have your watch delivered to your door. Once you fill out the online form above we’ll know which watch you want. The more specific you are the more accurate your quote will be. After we receive your inquiry, we’ll either ask you to call us or give you a call if we have any questions. Then we’ll give you a quote which will describe the brand, model, color, configuration etc. It will also detail how long it will take to get in stock and how much it will cost. If you agree to the terms in our quote, we’ll ask that you submit a deposit. Generally, that deposit will be between 10-20% of the cost of the watch. The deposit is non-refundable and non-transferable and must be made via wire transfer or cash at our store. The reason being that once you tell us which watch to order we put out the remainder of the money for that watch and get it ordered. But we cannot order you a watch, pay for it in full, then have you decide not to pay for it, hence the deposit. It is important that before you decide to special order a particular watch that you are sure that you want it. 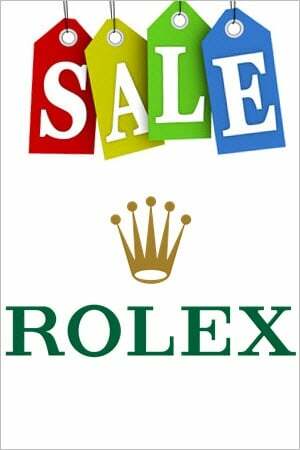 We suggest that you check out your local watch dealer, try the watch on and make sure you like it, and then come to us for the discounted price. Why would I want to Special Order my Watch? If you like our discounted prices, our excellent customer service, and our fast shipping but cannot find the watch you want - That’s okay! We can order you any watch you want, in any color configuration as long as the manufacturer actually makes that configuration. Would my watch be Aftermarket if I do a Special Order? That depends. If you ask for a custom dial or bezel to be placed on your watch then we will do that. If you ask for a factory original color or dial to be placed on the watch then we’ll order you the watch with the configuration you ask for. How long does a Watch Customization take? Let's say you want a Rolex Datejust with a custom diamond dial and diamond bezel configuration. We’ll take a plain Rolex Datejust and add the diamond bezel and diamond bezel for you. The entire process takes about 2-5 days from the time we get your deposit. How long does a Factory Original Special Edition/ Custom Order take? Lets say you want Rolex Daytona with a blue dial and a yellow gold and stainless steel band but only see it in champagne dial on our website. You place an order with us. We then in turn contact all our suppliers and get this piece ordered for you. However, since we don’t produce this piece ourselves we are at the mercy of the manufacturer. Thankfully however, more than 90% of the time we can get the watch in less than one week, but occasionally it takes up to 3 weeks. Does it cost more to Special Order my Watch? No, it’s the same price as what we would sell a similar watch for. For instance if you want a Rolex Datejust with blue dial and we one very similar but with white dial that sells for $7699, then your special order will be $7699. Why do you only accept Wire Transfer for Deposits? When you make a special order and put down a deposit for a watch we immediately begin calling our suppliers to source the watch. If our suppliers have it in stock we pay for it straight away with our own cash. If they don’t have it we pay for it in full then wait for the watch to arrive. 90% of the time that occurs within 2-4 days but 10% of the time it can take up to 3 weeks. A special order is just that, its special, meaning it’s a watch that is configured to specifically the way you want it. That means if you decide you don’t want it, we have to stock it and wait for another buyer that wants the exact same watch that you want. Another reason why our special order deposits are non-refundable and non-transferable.